Newhaven, UK — 3rd October 2018 APG Cash Drawer, a fast-growing global manufacturer of cash management solutions, announced today their SMARTtill Intelligent Cash Drawer has been installed in Dublin City University’s (DCU) new Londis store as part of its goal to maximize business efficiency by implementing the latest retail technology. about this new opportunity to be at the forefront of modern retailing. “We are thrilled to have received recognition for our pioneering cash management solution and to be represented amongst other in-store game changing advancements such as electronic labelling, solar powered signage and ultra-efficient chiller units. We look forward to continuing our work with partners to deliver innovative technologies that embrace emerging retail trends,” says Andrew Carr, EMEA Managing Director at APG Cash Drawer. “For brick and mortar retailers, experimenting with technology-led innovations is the only way to level the playing field in the battle against their online competitors. 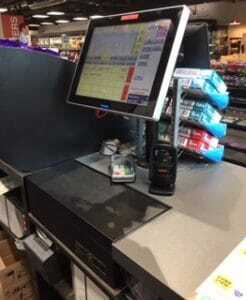 The SMARTtill Solution brings cash management to the next level for the modern convenience sector,“ said Andrew Carr.